Years ago, I used to live in a little flat on the side of a big house. It had a long set of stone stairs leading up to the front door, and the top of the stairs caught the sun for a good few hours a day, even in winter. One of the first things I did when I moved in was to buy the biggest terracotta pot I could find and plant it with as many different herbs as I could cram in. The pot soon expanded into two pots, then three, then four, and by the summer, I had a fairly complete herb garden growing in a variety of containers up the length of the steps. My landlady, the owner of the house, would sometimes knock on my door asking if she could have a sprig of this or that, and the pots did so well that there was plenty to go round. I never grew anything purely ornamental…everything had a culinary purpose, and whilst it did all look very attractive in full bloom, and smelt wonderful, aesthetics were not the primary reason for those pots. They were for the kitchen. This tendency to grow things for the kitchen has followed me around the various places I’ve lived over the years, until I find myself looking out at a small front garden with an eight foot bay tree, a hedge of rosemary next to a bed of marjoram, sage, and oregano, with some thyme plants dotted around and a quite lacklustre pot of chives on the side. The parsley is gone for the winter, but it’ll be planted again as an annual in the Spring, and there might be some tarragon to sneak in somewhere or other this year. 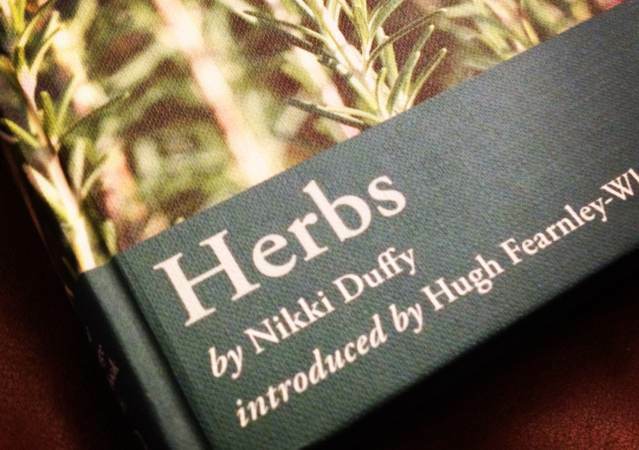 Duffy covers the essentials of growing and tending herbs, before launching into an A-Z of species which takes up a good half of the book, following that up with a substantial section of recipes. The A-Z is comprehensive, covering all the usual suspects, and many more unusual species, and sets out growing information next to practical culinary advice….how to grow it, how to cook it. The recipe part is definitely herby, but most cooking should be anyway, so it perhaps comes across as a little unsurprising, perhaps. That said, there are some superb ideas in and among the rhubarb crumbles and roast chickens (neither of which are bad ideas in themselves, obviously). Fudge made with fennel, ice cream infused with bay, lavender, lemon verbena or basil, raspberry vinegar with geranium (what? Geranium? )…that sort of thing. is a fantastic little book. Small enough to not overwhelm, packed with enough content to set the budding gardener and cook off in the right direction.